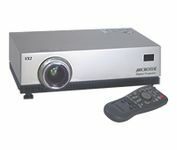 The Microtek VX2 Digital Projector presents the optimal value package, featuring native XGA 1024 x 768 resolution and bright 1000 ANSI lumens. Offering the convenience of plug-and-project setup, a full-featured remote, plus a full suite of connectivity options, the VX2 makes your presentation effortless. The projector is also equipped with two built-in RMS speakers, the Kensington MicroSaver Security System, and intuitive, easy-to-use On-Screen Display (OSD) controls. Weighing just 6.7 lbs, the VX2 is compact and portable for professionals on the road, yet bright enough to meet the needs of large presentations.